I spent more time in the chapters 4 – 7, though I did review Muhammad al-Asad’s technical interpretation of the Muqarnes, and though I am not sure I can explain all the mathematics of it, I can give you a general outline of the development of the Muqarnes as he defines them. Like Hawting’s book, I found Necipoglu’s work to be of a similar high context discourse on Islamic architecture and aesthetics that I cannot pretend I am all too familiar with, but her critiques of the discourses of what she refers to as the early 20th century Orientalist studies on geometric ornament is pertinent to our discussion for this class. Necipoglu’s study spans a huge geographic area, from Southern Spain through the Bukhara towards Western India (see map provided), and she is looking at the chronological period of roughly the 10th century through the 20th century, with the main thrust focusing on the medieval period. The book is a monographic study of a scroll that Necipoglu ascribes to late 15th, early 16th century Iran. The scroll contains a compendium of geometric ornamental architectural drawings that Necipoglu wants to employ as a way to discussion geometric ornament. “It is the earliest example we have of girih geometric analysis with implications for the theory and praxis of geometric design in Islamic architecture and ornament.” The Topkapi Scrolls compiles a rich repertory of geometric drawings for wall surfaces and vaults. A study of the tradition of architectural scrolls and drawings in the Islamic world, which Necipoglu adds gives contextual and historic relevance to the study of geometric ornament that has been missing in the discourse on geometric Arabesque in 19th and 20th century Europe. Belongs to an Islamic tradition of scrolls, and discussion of it must be placed in the discussion of the history of architectural drawings and scrolls in the Islamic world. Necipoglue also does a study on the history of the geometric mode in Islamic decoration through the vast geographical areas of the Islamic world and discusses the variegated meanings of geometric mode. She also discusses something she calls the “practical geometry” of decoration and its relation to the study of mathematics in the Islamic world. 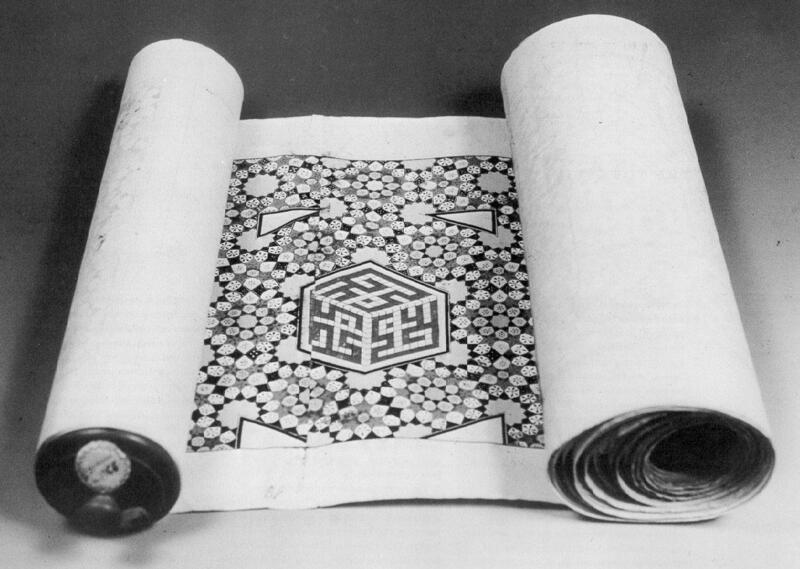 The first is that Geometric ornament (called Arabesque) has been written about without consideration of the role of scrolls that assisted in the conceptualization and transmission of the distinctive mode of design that came to be known as I mentioned, the girih in Persian-speaking Eastern Islamic lands. Ornament was considered as a subcategory in artistic form (esp. during Modernist Movements), but was “rediscovered” in the critical discourse on design in the 19th century when European Industrialist searches for motifs that could be mass produced –turned their eye ‘East’. The spiritual essence of Arab art was embodied in the arabesque, with its three types of interlaced variants: vegetal, calligraphic and geometric. Arabesque was developed by Orientalists looking at Arabs in N. Africa, Syria, and Spain during the 19th century, when artistic styles very often were defined as reflections of racial and religious mentalities. The presence of figural imagery, whether in architectural decoration, objects, textiles or manuscript painting, was intentionally down-played in constructing the otherness of the “Arabo-Islamic” visual tradition. Using the generally classified terms (see above), the so-called arabesque was assigned purely decorative functions that differed fundamentally from the iconographic tradition of Western Representational art. Which means the arabesque was pretty, without much meaning behind it. Kind of like the exoticized Arab. Necipoglu rejects the 19th century idea that geometric ornament is a reflection of the particular ethnic ‘genius’ and the more recent conclusions that geometric ornament should be universally equated with specific Islamic religious trends such as Sufism or with basic Islamic concepts such as the proclamation of the Divine Unity, or tawhid. Description of abstract Arab ornament in terms of three dominant elements (see above) originating in nomadic tents would be repeated in countless publications. Girih was presented divorced from its context as a way for a European professional audience to study and or copy, but ultimately not to understand but consume. These readings were also clear not only in the chromolithographic plates, but also encyclopedias on ornament which classified girih according to ethno-racial categories: Moresque, Persian, Turkish etc. Which creates a scheme to interpreting girih without realizing the multiethnic culture of pre-modern Islamic dynasties, whose rule was trans-geographical, of mixed ethnoracial makeup and multiple religious practices –including religious minorities. This was set against a backdrop where there was the interpretation, as I stated earlier of a vertical paradigm of anuniversal Muslim visual tradition – and that these on Islamic visual culture were the dominant dialects on of the 19th century. The Grammar of Ornament was the first study to adopt a systematic approach aimed at formulating a rational language of ornament appropriate for the modern industrial age. There are no Islamic architectural working drawings from the pre-Mongol era. Conventions for representing architecture on parchment go back to an early Koranic manuscript discovered in Yemen from the 10th century. Use of drawings in Medieval Islamic architectural practice is also implied in philosophical and ethical texts. (pg. 22) The muqarnes were a subcategory of the girih genre, which embodied both two and three dimensional patters generated by similar geometric grid system. Girih or kar-bandi. So what is Islamic about Arabesque, and why is it used throughout the Islamicate world? Girih (persian word meaning ‘knot’) was a mode originating in Baghdad between the 10th and 11th centuries and links its inception to the popularization of mathematical knowledge absorbed from classical sources and its application to the needs of various crafts. Rasa’il (anonymous authors known as Ikhwan al-Safa). The Rasa’il explore the theoretical links between mathematics and various crafts and lay particular stress on the importance of harmonic proportion in calligraphy, architecture and painting. How can one demonstrate concepts of harmonic proportion as useful to craftsman? Abu’l Wafa al-Buzjani (d.998) whose treatise A’mal al handasa links the world of geometric theory with its practical applications. Provides practical advice for student craftsmen seeking to use geometry in their own professions. One important factor in the popularity of the girih modes was the fact that despite their surface complexity, many such designs could be produced by craftsmen with little understand of the geometrical theory behind their creation. The Girih mode is a ornamental system that has been utilized theoretically as a signifier of dynastic identity and/or visual regimes. The Girish mode is presented as a visual sign for the Sunni revival, because the pattern of its dissemination from Baghdad is hypothesized to reflect the political relationships of other Islamic regions wit the Abbasid caliphate. Whereas Necipoglu argues that almost any decoratice system had the potential to be used as a visual dynastic symbol. Necipoglu’s hypothesis critiques the idea that Islmaic ornament is a universally applicable system with a fixed mean. She provides a new foundation for considering the role of geometric ornament in the visual traditions of the medieval Islamic world, and initiates a debate about how to interpret the other ornamental traditions used in pre-modern Islamic regions.